A licensing system that gives users excellent visibility and flexible control over their license status and usage. 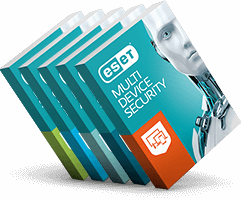 All ESET's business solutions and business packs utilize a single license key for all included products. Group multiple licenses under one account, with user-defined e-mail address and your own password, making organization with licenses even more user-friendly. Your licenses are updated, and any changes automatically transferred after license upgrade, renewal or any other modification. Unilicense covers most popular computer, smartphone and tablet and file server operating systems, allowing you to mix and match endpoint protection among devices. You can switch to a different platform without having to purchase additional licenses. ESET Unilicense covers all the bases, allowing you to mix and match endpoint protection according to your actual needs – without wasting a single license. Switch the protection from one platform to another. You can do so anytime during the license term, without having to purchase additional licenses. In addition, you can transfer a valid ESET license to a completely new computer, provided you cease using the old one. The transfer includes switching from one OS to another as well. A unique string in the format XXXX-XXXX-XXXX-XXXX-XXXX is used for identification of the license owner and activation of the license. In order to support users with older products that accept legacy files as a form of activation, ESET Business Account allows you to generate these files. ESET Business Account lets you allocate a certain number of licenses to an offline file. Using the offline file, products without a direct connection to the internet can be easily activated. If you hold ESET licenses in an older format (username/password), you can easily convert them to the new format (license key) using ESET Business Account. A short string used to identify the license to a third party ﴾for example, the security admin responsible for the unit/seat distribution﴿. Person who registers a new company in the ESET Business Account is the owner. As the account owner, you will be able to add licenses and assign other users to access ESET Business Account. It's a free licensing management platform for business customers seeking more control, reporting and overview of their ESET licenses for all on-premise or cloud-based products and the primary entry point for ESET cloud services, including ESET Cloud Administrator. Easily generate a 30-day trial license for products manageable via ESET Cloud Administrator, or on-premise via ESET Security Management Center. Deactivate and recoup immediately: no license is wasted or lost. Monitor real-time status and usage all your ESET business licenses, in one place. Generate offline license files in environments without internet connectivity. Updates all license details and ensures all your licenses are compatible with new products.